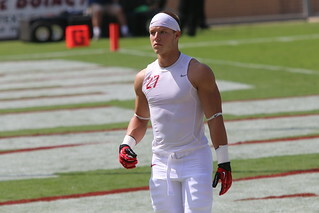 After a record setting season in 2015 expectations were off the charts for Christian McCaffrey and the Stanford Cardinal in 2016. After early blowoutlosses to Washington and Washington State, and defenses keying on McCaffrey, both the player and the team drifted out of the spotlight a bit. However, as the season progressed, McCaffrey came to life and so did Stanford, finishing the season strong with six straight wins. While electric on the field, Christian McCaffrey’s Wonderlic test score of 21 at the NFL Combine in February was average at best. This is somewhat surprising given how well other Stanford alumni have performed on the Wonderlic test including Andrew Luck. McCaffrey made the controversial decision to skip Stanford’s bowl game against North Carolina as he opted to leave early and pursue his NFL dream by declaring himself eligible for the NFL draft. Small in stature for a traditional running back, many had doubts about his ability to play at the NFL level. However with McCaffrey’s impressive stats while at Stanford and his even more impressive highlight reel, it was obvious that he would be a top selection at the 2017 draft. The Wonderlic is a cognitive ability test used by the NFL and many other professional organizations to determine a person’s ability to answer questions both effectively and quickly. It is given around the world primarily by companies during their hiring process or by academic institutions to evaluate potential students. The Wonderlic test is a timed test lasting just 12 minutes and costs of 50 questions. That’s a mere 14 seconds per question, which forces test takers to quickly answer questions and answer as many of them correctly. In fact, the test was originally created so that only 2-5% of all test takers actually complete the test. McCaffrey along with other starts at the Combine will be up against many different tests including the Wonderlic. Other tests measure speed, agility, strength and other athletic abilities, but nothing is quite like the Wonderlic.